Whom Christ called greater than all the earthborn? 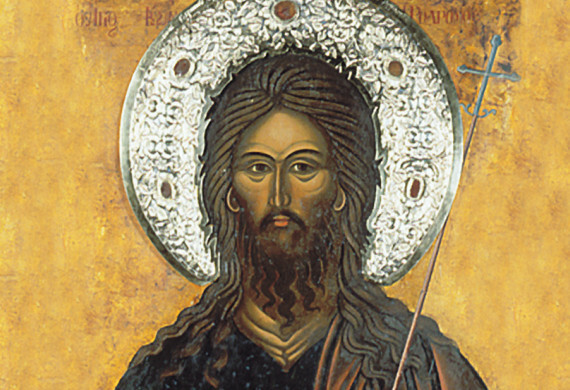 On this day is the Commemoration of the Holy Prophet, Forerunner and Baptist John next to the Taurus. It appears that next to the Forum of Taurus in Constantinople, there was a church dedicated to John the Baptist which was probably consecrated on this day. The Forum of Taurus, or the "Market of the Bull", in Constantinople was created by Constantine the Great. It was situated along the main road of the new city, the Mese, ¾ km west of the Forum of Constantine, and is more or less identical to modern Beyazıt Square. More than half a century after Constantine had created it - in 393, to be precise - the marketplace was redecorated by the emperor Theodosius I; it was from now on called Forum of Theodosius. It was Constantinople's largest public square.